At a House Science Committee hearing on climate science this week, participants debated the validity of the scientific consensus on the subject. 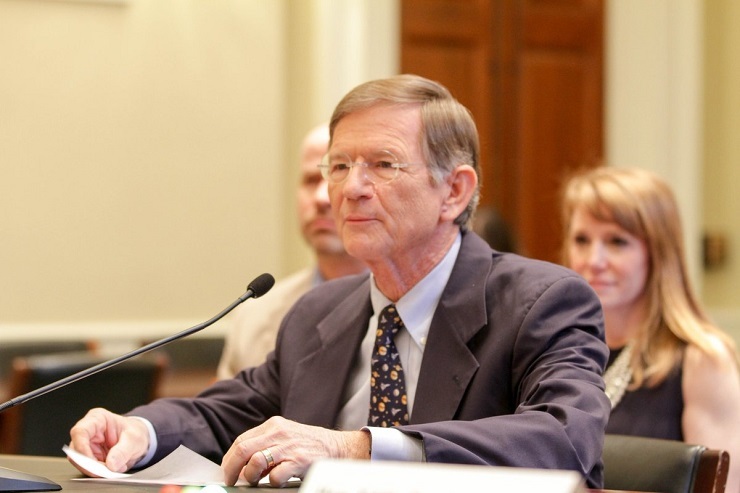 Committee Chair Lamar Smith (R-TX) also used the event to further articulate the view that many scientists are not routinely following proper scientific method — an increasingly prevalent theme in the committee’s work. House Science Committee Chair Lamar Smith (R-TX) testifying before the Committee on House Administration in February 2017. On March 29, the House Science Committee convened a hearing titled, “Climate Science: Assumptions, Policy Implications, and the Scientific Method.” The witnesses were all academic researchers. The three invited by the committee’s Republican majority — Judith Curry, John Christy, and Roger Pielke, Jr. — have often been at odds with the climate research establishment. Michael Mann, the Democratic minority’s invitee, has also been embroiled in the rhetorical and legal battles surrounding climate science. Much of the discussion at the hearing concerned particular, often well-worn questions of climate science. At other times, various grievances were aired concerning ad hominem accusations and other aggressive tactics used to challenge or protect what constitutes good-faith scientific discourse and public communication. However, the hearing also represented the latest in a string of committee activities revolving around methodological legitimacy in scientific research. Notably, Committee Chair Lamar Smith (R-TX) used the occasion to further articulate his conception of what constitutes “sound science.” The hearing also explored in some detail the question of whether entire fields of research can become corrupted, thus necessitating congressional attention. The scientific method is a simple process that has been used for centuries. It involves identifying a question, developing a hypothesis, constructing an experiment, and analyzing the results. If the results do not align with the original hypothesis, the hypothesis must be re-examined. The scientific method welcomes critiques so theories can be refined. Alarmist predictions amount to nothing more than wild guesses. The ability to predict far into the future is impossible. Anyone stating what the climate will be in 500 years or even at the end of the century is not credible. Expanding on the definition of “consensus,” she pointed to the work of the Intergovernmental Panel on Climate Change (IPCC), and to reports issued by the National Academy of Sciences and by scientific academies in other nations. She also pointed to the opinion of scientific societies that have “affirmed the overwhelming scientific evidence for human caused climate change,” specifically naming the American Association for the Advancement of Science, the American Physical Society, the American Geophysical Union, and the American Meteorological Society. APS and AMS are AIP Member Societies. However, witnesses invited by the majority challenged the notion that scientific consensus-building is a reliable process, with Curry calling the prevailing consensus “manufactured.” They variously described the effects of “groupthink,” bully tactics, and prejudiced methodologies as enshrining certain scientific opinions while excluding others such as their own. Grand compilations such as the IPCC, the National Climate Assessment, pronouncements from scientific societies — who never do any scientific work on the problem, by the way, for their results — and even EPA’s endangerment finding are on the whole written by those who are not scientifically dispassionate. While Curry and Christy were hostile to IPCC, Pielke emphasized that his own work on links between climate change and extreme weather events is consistent with the findings of the international panel. However, he also said his views had been unfairly attacked by others, and, with the other majority witnesses, urged that scientific assessment and advisory mechanisms should provide better exposure to minority viewpoints. It doesn’t matter if individual scientists are bad persons. We all have faults as human beings. If our understanding depended on one or a small number of individuals, their opinions, then of course we would not accept these findings as valid. It’s the fact that the entire community of climate scientists around the world, arguing back and forth in the peer-reviewed literature, contesting each other at meetings, have all from different directions come to the same conclusions. And all of the scientific assessments that have been done. … Those are the facts, and we can’t dispute the facts. The scientific method has become a central issue in the committee’s work this year. On Wednesday, the House passed the “HONEST Act,” a committee bill that, if enacted, would require all new Environmental Protection Agency regulations to be based on research that is “reproducible” using openly available data. On Thursday, the House passed another bill that would require EPA to broaden the membership of its Science Advisory Board to include more viewpoints and restrict recipients of EPA grants from participating. Smith, in particular, has often justified those bills and their predecessors by suggesting that EPA rulemaking has been systematically tainted by politics and is underpinned by science that is opaque and possibly of poor quality. His opponents argue the proposed regulations would impose burdens that would restrict EPA’s ability to use available research, and are moreover unnecessary because existing procedures are based on the preponderance of evidence found in the peer-reviewed literature. Smith, though, has in turn suggested that such attitudes are a relic of a passing era of “trust-me science.” Increasingly, he has pointed to discussions within the scientific community about widespread difficulties in reproducing results found within the peer-reviewed literature. The lack of reproducibility is a warning that the scientific method is not being followed and that the theory may lack credibility. The committee’s thinking on this issue could find its way into additional legislation. It has already said it is planning broad new legislation for the National Science Foundation, and scientific transparency and method were major themes at the second of two hearings the committee recently held on NSF policy. The committee has also mentioned it wants the Trump administration to be tasked with a “government-wide review of climate change research.” The issues of methodology and consensus discussed at this week’s hearing may have some bearing on that effort.